Pop Quiz: Is that email that just arrived in your inbox important or not? Chances are you can quickly look at who it's from and the subject line and make an educated guess. The engineers behind Gmail think they can make a pretty good guess, too. They're rolling out a feature called Priority Inbox that aims to separate the really essential email from all the other dross that flows into our inboxes daily. Google says it finds important messages by looking at who you correspond with most frequently, whose messages you regularly open and reply to, what words are in the emails that you're most likely to open and how directly a message is addressed to you. If you choose the Priority Inbox option, it'll put those important messages right at the top of your inbox. There's also a section that shows the messages you've starred, followed by a section for "Everything Else." Google says it'll be rolling Priority Inbox out to consumer accounts starting tonight. Google apps users can get the feature if their administrator okays adding features that are in development. If Gmail's algorithm gets things wrong, you can train it. The Priority Inbox setting adds a plus and minus button at the top of each message; you can click plus for urgent notes from your boss and the minus button for "exciting offers" from some web store you ordered from once. You can also fine-tune the sections. The default is to show your important and unread messages at the top, but you can change the setting to show all important messages in your inbox, whether you've read them or not. You can also add new sections: If you've created a label that you apply to every message about a big project, you can create a section that shows the latest messages with that label. How well does Priority Inbox work? That's hard to tell. Google turned the feature on in one of my personal Gmail accounts late this evening, so it's hardly had enough time to learn what I'm really interested in. If it can get that analysis right, though, this should be a real help to anyone who gets dozens or hundreds of emails a day. The feature reminds me of an innovation in the new Hotmail that lets you easily see all the mail that comes from one of the people you've designated as a contact. Gmail's approach has the potential to catch more of your important missives while requiring you to do less work -- if the algorithm works well. But I think Google is missing an opportunity to help people deal with the other end of the email spectrum -- getting rid of the mail they don't care about. We all get mail that's not really spam, but that we're just not interested in: newsletters we no longer read and an aunt's chain letters that we'll never open. If Google can figure out what we really care about, they should be able to know what we don't care about, too, and offer to let us get rid of it in one fell swoop. You can, of course, do that now in Gmail using filters. But many people will never take the trouble to set them up. 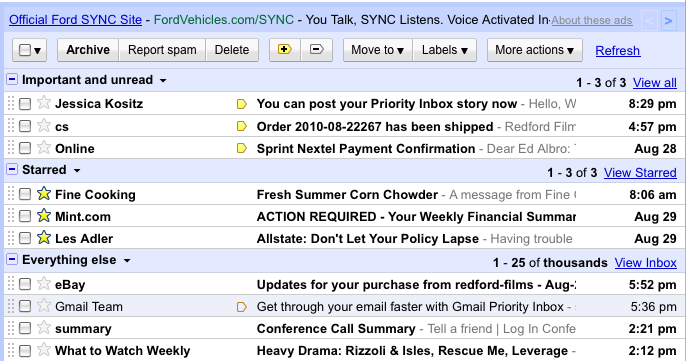 This is another area where Hotmail has gotten the jump on Gmail. That service's Sweep feature lets you hover over the name of a sender and choose to delete all their messages, past and future.